Founded in 2002, Massage Envy, a nationwide wellness franchise that’s independently owned and operated, provides massage and skin care services. To date, there are more than 1,200 locations in the United States, with the entire franchise serving more than 100 million services. Glancing at the official website, the company doesn’t clearly specify the prices of their messages, with the exception of some add-ons, when you attempt to book; rather, it appears you will receive a total when you show up to your booked appointment. Regardless of which option you choose (massage or facial), the prices tend to in $40 to $200, depending on if you’re a member or not. NOTE: These prices will vary on location and should only be used as an estimate only. For more information on exact prices, we highly encourage you to contact your local Massage Envy for accurate pricing information. How much do people tip at Massage Envy? From the looks of it glancing at reviews for some locations, the average tip tends to be in the $10 to $20 range per service, but some have said they received unwanted comments if the tip was less than $10. From a previous employee who worked there, she was happy with any tip greater than $20. If you do decide to become a member, TripSavvy notes that you do need to commit for the entire year by signing a one-year contract, where you agree to be billed monthly, whether you use the services or not. As mentioned above, members are able to roll over their free session to the next month if they do not use it or even extend a massage session to 90 minutes. You’re also able to give them away to family or friends for a $10 surcharge. Using gentle techniques, this type of therapy helps address the head bones, spinal column and sacrum, providing relief for headaches, back pain and TMJD, to name a few. Similar to that of a Swedish massage, a deep tissue massage focuses on the deepest layers of the muscle, targeting knots, all while helping release chronic muscle tension. Helps relieve anxiety and depression in elderly patients, all while maintaining and improving their health. A therapeutic choice for pregnant women, with each option catering to the individual. Reflexology applies pressure to what’s known as the “reflex zones” in the hands and feet, which helps relieve stress and promote relaxation. Designed for athletes, each sports massage is catered to the sport played, with focuses on troublesome areas such as the knees and shoulders, for example. One of the most popular types offered, according to the company, a Swedish massage helps reduce pain, boost your mood and promote relaxation, ranging from a light to medium pressure. A trigger point, which is a tight area with your muscle tissue that causes certain paint, is designed to alleviate the source of the pain via cycles in order to isolate the pressure and then release. An exclusive Microderm Infusion designed to go “above and beyond” traditional microdermabrasion treatments. The Massage Envy chemical peel, as per the company, features PCA SKIN, revealing healthy, glowing skin and is designed to deliver dramatic results in a non-clinical environment with little downtime. All of the therapists are said to be licensed and professional, with the company recruiting help from local massage schools, but the talent level, depending on the location, can range from rookies to experienced professionals. 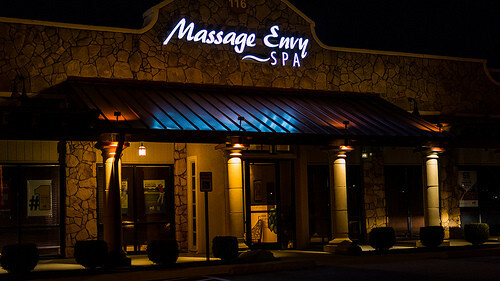 To find a Massage Envy location near you, use the official “Find a Location” tool. Occasionally, you may be able to find a Groupon-like deal for your local Massage Envy, potentially saving you up to 80%. Be sure to check out the daily deal website before making an appointment to see if you can save even more.